You guys! I have figured out THE recipe for lemon bars! They are oozing with luscious filling atop a buttery shortbread crust. They have the perfect blend of sweetness and tart lemon flavor. Perfection!! A few years ago, I tried making some lemon bars. 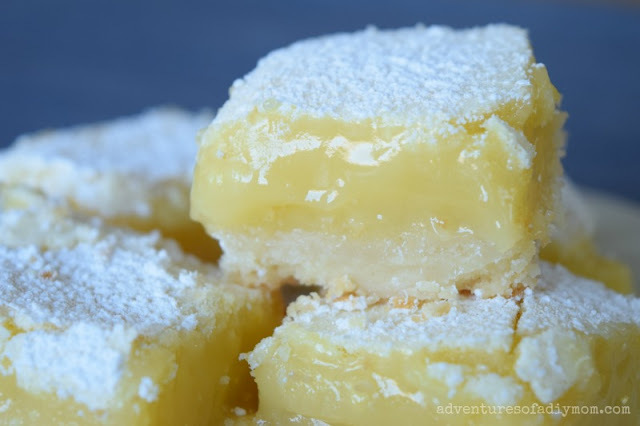 I love a LOT of filling in lemon bars and they were perfect in that regard. However they were quite sour. So much so that they ended up being thrown out. I have been dying to try an adjustment of that recipe, but was unsure of how to lower the amount of lemon juice without reducing the amount of filling. It occurred to me to try replacing some of the lemon juice with water. I worried it wouldn't set up, but it worked out!! Today I'm sharing the recipe. How do you know when lemon bars are done? For me, after 30 minutes the bars were still quite jiggly when moved. I baked them another five minutes and there was only a very slight movement when I wiggled the pan. To me this was the perfect timing. It created a gooey filling, but it still held up and wasn't runny. How long will lemon squares keep? I have found that the longer you keep them, the less "gooey" they become. They will stay good for up to 4 days, but they don't seem to last that long around here. Mix filling ingredients and pour into cooled crust. Bake at 350 for 30-35 minutes. When they are done, they should only very slightly jiggle. Cool to room temperature or chill in refrigerator before cutting. You can double the recipe and bake in a 9 X 13 pan. Baking times may increase slightly. 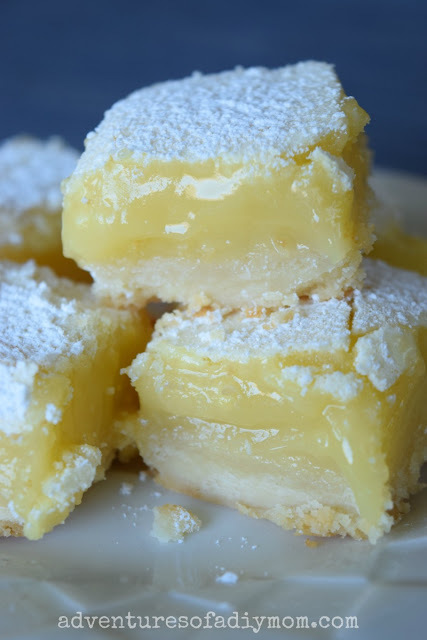 How should I store lemon bars? 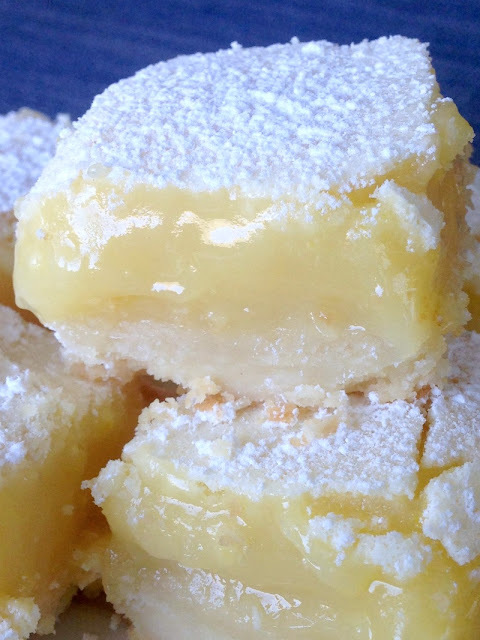 Because of the custard nature of lemon bars, they should be refrigerated if not eaten the same day they are baked. It is fine to leave them out at room temperature for a few hours, such as on a party platter. I love anything with lemon, and these bards sound absolutely delicious. Oh these look good ... pinned! Yum, I am pinning this recipe. My husband loves anything lemon.I have to make these for him , thank you ! I know we both will love them ! 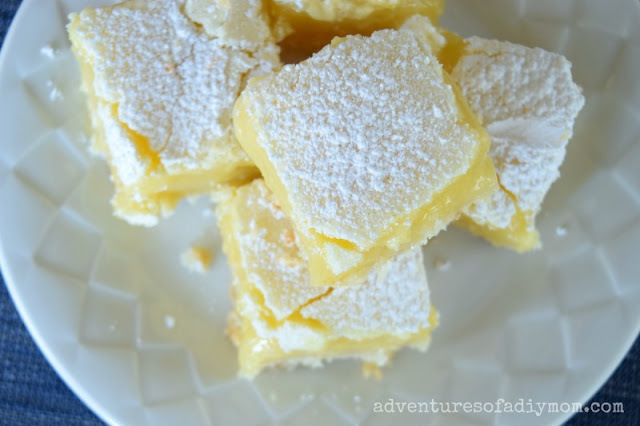 Your lemon bars look amazing! 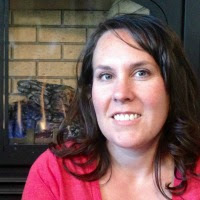 Thanks so much for sharing your post with us at Full Plate Thursday, we have really enjoyed it. Hope you have a great day and come back soon! In your recipe you said to bake the crust @ 150 degrees for 15 to 20 min. Did you make a typo with 150 rather than 350 or is that what you meant to say? Totally a typo! Bake at 350. Thanks for catching that, I fixed it!